Water temperatures can vary. Shallow lakes can get up to a blamy 25C in summer but mountain rivers may struggle to reach 20C. Much of the year outdoor waters are around 12C – 17C so the key is to arrive at the swimming hole so hot and sweaty you can’t wait to strip off and plunge in. Plan a good hearty walk to get there, and put on lots of warm clothes before you arrive. Once you’re in the water it takes a few minutes before the cold feeling goes away, so persevere. In general, the more you swim in cold water the less you feel the cold and the greater the health benefits of what is called ‘cold adaptation’. Don’t stay in too long without a wetsuit, though, and definitely get out and warm up after 20 minutes or if you start to shiver. Put on warm clothes immediately after a swim and combine this with something active: walk up a hill or do some star jumps. What to wear… if anything? You’ll have more confidence, and be better able to explore, if you have footwear (e.g. old trainers, jelly beans etc) and goggles. A normal surfing wetsuit, a sleeveless wetsuit top or a specialist triathlon wetsuit will all help you stay warm longer. Make sure you bring towels, a picnic rug, midge repellent, suntan lotion, sunhats and plastic bags for all your wet kit. Inflatables are popular but make sure people won’t drift away on them, especially non-swimmers. A proper buoyancy aid (about £40) is safer, and fun too. 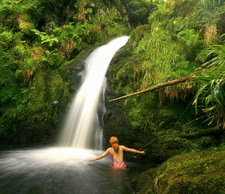 If you come across a magical pool on a walk it’s quite possible to swim even without any kit. Wear your undies or go naked if it is secluded. If you have no towel wipe most of the water off with your hands then sacrifice one item of clothing to dry yourself with or travel with a small, light cotton sarong. Very helpful website……… my life has been transformed by wild swimming.